Diwali is round the corner and its time to enjoy the crispy crunchy diwali savories. Chakli (spicy murukku) is one of the popular snack all throughout India that is prepared for festivals. 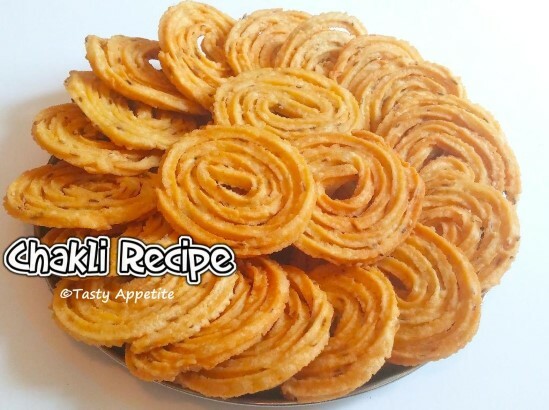 Its a deep fried spiral shaped spicy snack recipe prepared with rice flour flavored with cumin & sesame seeds. This tempting snacks makes a perfect combo with hot cup of coffee or chai. Try this simple video recipe and enjoy the healthy snack. Take raw rice flour in mixing bowl. Add urad dal flour, fried gram flour and mix. Add salt, hing, cumin, sesame seeds, turmeric pwd and red chilly pwd. The dough should be in thick consistency as shown in video. Cover the dough and let it rest for 5 mins. Meanwhile clean the murukku mould and grease it with oil. Grease the butter paper with oil and keep ready. Take a small ball of the dough and stuff in mould. Press the mould in circles to make the chakli shape. Repeat the same for the rest of the dough and keep the chaklis ready for frying in oil. Drop the chakli one by one in hot oil. Keep the flame in medium heat and deep fry the chaklis. Flip it once in a while and fry until the chaklis turn golden & crispy. Drain and remove in kitchen tissue. Spicy delicious Chaklis are ready. Enjoy with hot cup of tea or coffee. It makes a healthy snacks for kids too. It has 2 to 3 weeks of shelf life when stored in air-tight container.